PFOA stays—quietly accumulating in our tissues – for a lifetime. The toxic legacy that will stick around forever. PFOA is a likely human carcinogen, according to a science panel commissioned by the Environmental Protection Agency. 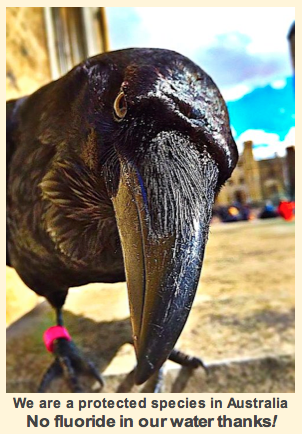 It shows up in dolphins off the Florida coast and polar bears in the Arctic; it is present, according to a range of studies, in the bloodstream of almost every American—and even in newborns (where it may be associated with decreased birth weight and head circumference). The nonprofit watchdog organization Environmental Working Group (ewg) calls pfoa and its close chemical relatives “the most persistent synthetic chemicals known to man.” And although DuPont, the nation’s sole Teflon manufacturer, likes to chirp that its product makes “cleanup a breeze,” it is now becoming apparent that cleansing ourselves ofpfoa is nearly impossible.
. Food is another: Pizza-slice paper, microwave-popcorn bags, ice cream cartons, and other food packages are often lined with Zonyl, another DuPont brand. Technically, Zonyl does not contain pfoa, but it is made with fluorotelomer chemicals that break down into pfoa. 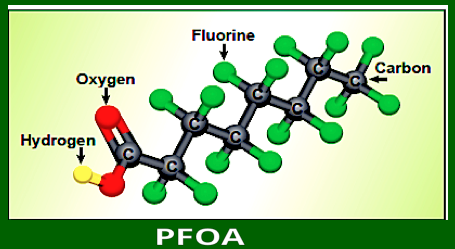 Regardless of how it gets into our bodies, once there, pfoa stays—quietly accumulating in our tissues, for a lifetime. Teflon is not the only nonstick, non-stain brand that has turned out to be stickier than advertised. 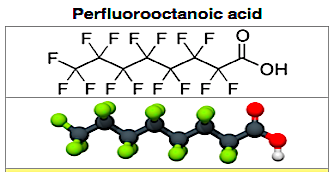 Scotchgard and Gore-Tex, to name just two, are also made with pfoa or other perfluorochemicals (pfcs). Last year the epa hit the 3M corporation, maker of Scotchgard, with a $1.5 million penalty for failing to report pfoa and pfchealth data. Chemicals similar to pfoa have recently turned up in water supplies of suburban Minneapolis and St. Paul, near 3M facilities. So far, it seems to be holding. Nonstick pots and pans account for 70 percent of all cookware sold. “Amazingly enough, all the publicity has had no impact on sales,” says Hugh Rushing, executive vice president of the Cookware Manufacturers’ Association. “People read so much about the supposed dangers in the environment that they get a tin ear about it”—though sales of cast-iron skillets, touted as a safer alternative, have doubled in the last five years, in large part because of ”the Teflon issue,” according to cast-iron manufacturer Lodge. → TEFLON FUMES CAN KILL PET BIRDS ← at 660, they can cause the flulike “polymer fume fever” in humans. Even at normal cooking temperatures, two of four brands of frying pans tested in a study cosponsored by DuPont gave off trace amounts of gaseous pfoa and other perfluorated chemicals. In the case of pfoa, it was left to the epa to finally investigate the risk to public health. That assessment, begun in 2000, is expected to go on for years. If pfoa is determined to be a proven (not merely likely) carcinogen, says agency spokeswoman Enesta Jones, “this chemical could be banned.” It would be one of theepa’s very few outright bans since 1996, when it proscribed ozone-depleting chlorofluorocarbons. DuPont was the world’s biggest producer of those too. blood levels of 10 micrograms per liter.